Superior representation throughout Washington, D.C. There are some injuries so devastating that they can alter your life permanently. At Paulson & Nace, PLLC, our skilled team of trial attorneys helps to protect the futures of those who have suffered a catastrophic injury as the result of someone else’s negligence. If your family’s future is in jeopardy, our family will stop at nothing to help yours. Our reputation as some of the strongest client advocates in Washington, D.C. has been widely acknowledged by former clients, peers and the judiciary for more than 40 years. We have the skills, the resources and the experience you want on your side when a catastrophic injury has irreparably changed your life. Catastrophic injuries such as these may require months or years of physical therapy, rehabilitation or lifelong medical treatment. A traumatic brain injury could necessitate a victim relearning how to walk or speak, or could render a patient into a permanent vegetative state. Motor vehicle accidents, especially those involving high-impact collisions or multi-car collisions, could lead to the amputation of a limb. In some cases of medical malpractice, a surgical error or a mistake with anesthesia could cause permanent brain damage or prevent a person from living a happy and healthy life. At our firm, we have successfully obtained millions of dollars in verdicts and settlements for our clients who have suffered with catastrophic injuries like the ones discussed here. We understand that these types of cases may take a long time, and we are willing to stay by your side until the job is done. We only use authoritative testimony to bolster our clients’ cases and utilize cutting-edge technologies to create informative visual displays for our clients during trials. Because we are willing to litigate in court, our trial attorneys are comfortable in front of juries and judges, and know how to explain what happened to you clearly and concisely. When our lawyers begin to build a case on your behalf, your future and best interests are always first in our minds. That is why we refuse to settle a case for less than you deserve. We are unafraid to face large insurance companies whose primary goal is to keep as much money as they can. We are powerful advocates for victims, and we do not rest until we know that the needs of our clients have been met. 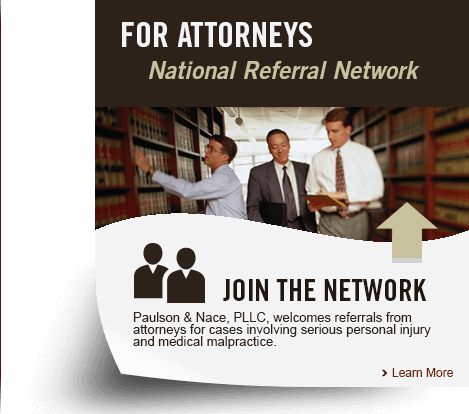 Paulson & Nace, PLLC, is proud to represent personal injury victims throughout Washington, D.C.. If you have suffered a catastrophic injury, you do not have to face your fears alone. To schedule a no-obligation consultation at our office, please call 202-930-0292 or fill out our contact form.